Questions PayPal will never ask you in an email. 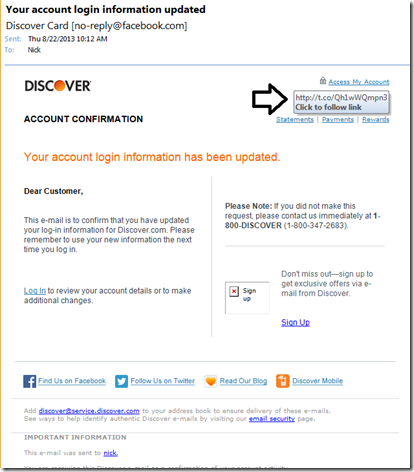 If you look at the links on this fake Discover email, you will find that they all show as link shorted addresses. Short Link services may be convenient but they are also a great way to hide the real address you are being sent to. If you are ever confronted by a short link and you want to verify it before clicking, you can use services like LongURL to verify the link. In the case of the fake Discover email, the LongURL service shows me that one of the links in the email takes me to a site that definitely has nothing to do with Discover. When it comes to any online account, if you get any email or any other social media message, the best thing to do is open a web browser, manually type the address of the company and sign in to the page you typed, don’t use a link as that link will probably redirect you to places you don’t want to go. If you are still not sure, call the companies support line and let them know about the message you received. If it’s a real message they will be able to confirm it. 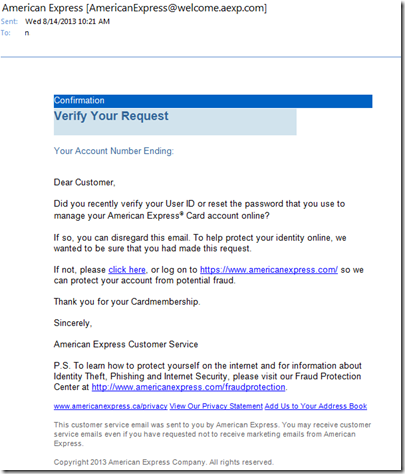 Finally, we have American Express and their concern about a change to my User ID, and of course them wanting to confirm my details. The links on the screen do say AmericanExpress.com but if you look closing at the link itself, the page it will take you to is just a number. What these guys couldn’t afford to pay $10 for an actual website name, to at least seem like they are trying. No company with a reputation will just send you a link to an IP address (at least I’ve never come across one who has). 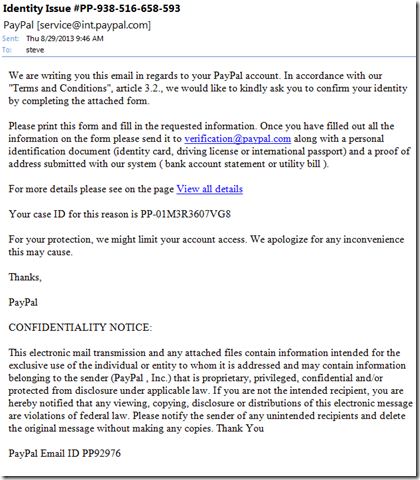 If you do get a fake email, you should just delete it.